What is your Stretch Collectors Status? There are 6 catagories of Stretch Collectors. 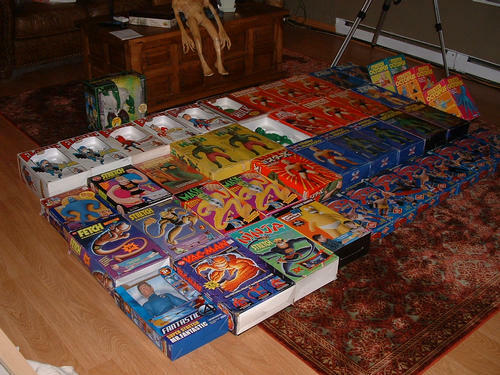 Here you can see just how well you measure up to all the Stretch Collectors out there. 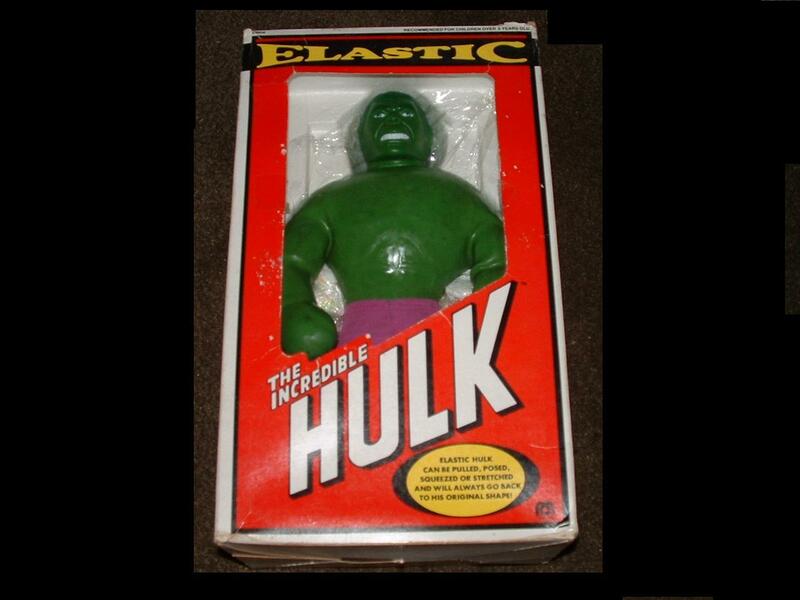 Basically, A Stretchy is the very beginner of a Stretch Collector which owns up to 3 of the original first 5 Vintage Stretch Figures not including the Serpent or the Denys Hulk. 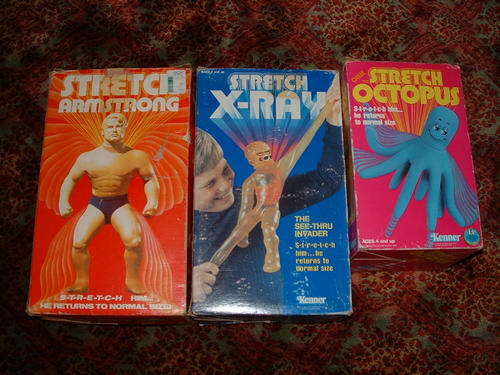 A Stretchy may have one Armstrong, X Ray. or even a Monster.A Stretchy is not yet considered a true colletor.This Stretchy Status may lead to Bigger things. 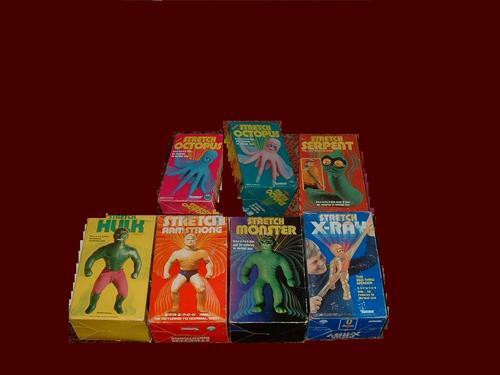 You have now become a Stretch Collector owning the First 5 of the origianal Vintage Stretch Figures. 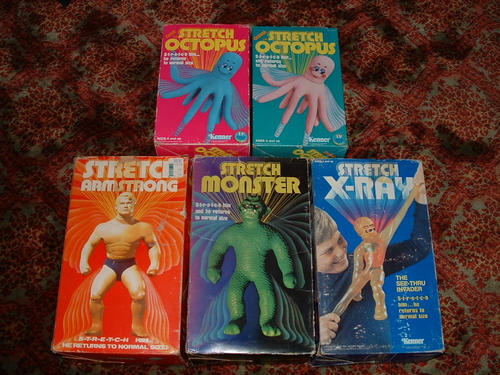 Stretch Armstrong, Monster, X Ray,Ollie Octopus and Olivia Octopus. Once Stretch Collector Status is reached, I garuntee it will be immpossible to stop untill one reaches at least the next level. Alpha 7 Status is a very difficult and rewarding level to reach. An Alpha 7 Stretch Collector must obtain all the origianl first 7 Stretches made from 1976 to 1979. These would include, Stretch Armstrong,Monster,X Ray,Ollie Octopus, Olivia Octopus, The Almighty Stretch Serpent and the Elite Denys Fisher Stretch Incredible Hulk. Alpha 7 Status is only achieved by the most stubborn, relentless stop at nothing Stretch Collectors. A true Elite Status within the Stretch Kingdom! Elite Status is reached once an Alpha 7 Collector obtains one of the stretches on the Top 14 Rarest Stretches Page of this site. 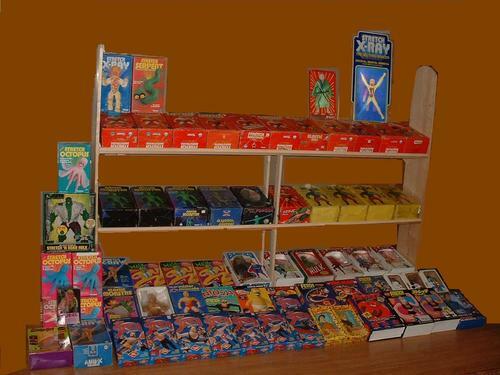 This would not include the Serpent or the Denys Fisher Hulk because an Alpha 7 Collector would already have them.I displayed arrows next to some of the Top 14 Stretches in this picture. Elite Status is not only a Level reached but also the ongoing phase of colleting all the Stretches up to the Next Status Level.The Elite Status is the most difficult level of collecting to break through taking many years which makes reaching the next level very unlikely. The Status and Title of The Stretch King can only be obtained in one way. 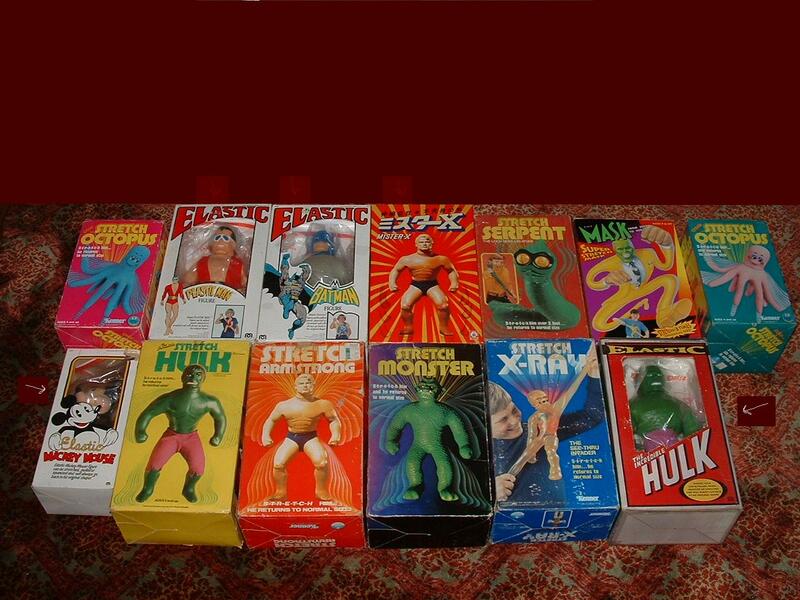 An Elite Collector must search high and low, near and far, to the moon and back and obtain every Stretch that I "The Stretch King" currently has displayed here on Stretch Armstrong World. Only then may one attain the Highest most Powerfull position in all the land, The Ruler of all Rulers ! The Stretch Wizard! For I am the Stretch King . As the current reigning Stretch King , my Wizard Status is only 1 stretch away!All i need is the Ensueno Elatico Batman! So come forth all you Stretch Collectors and dare to Challange me in a duo for becomming the one and only Stretch Kingdom Wizard! Wizard Status has finally been reached. 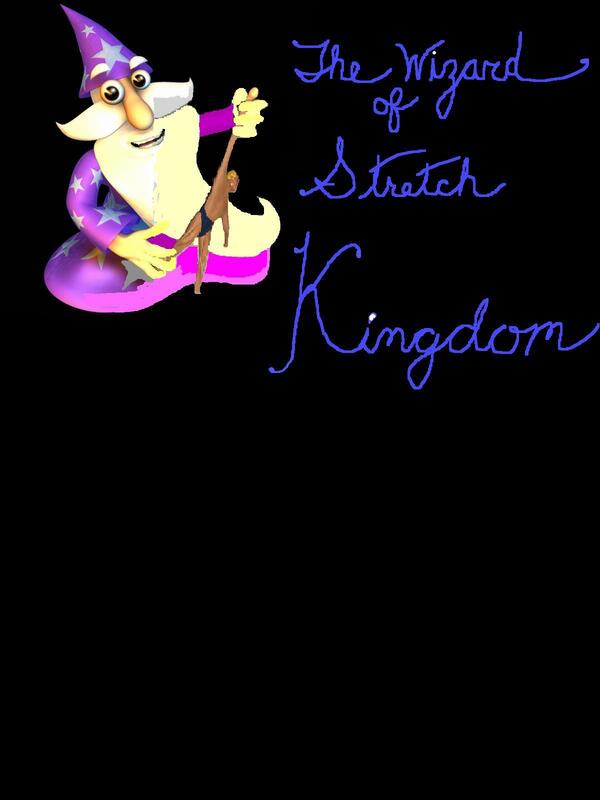 I, "The Stretch King" am now the Stretch Wizard. With my most recent purchase of the most elusive Ensueno Elastico batman figure, I am the only person in the world to have owned every full size stretch figure ever produced.The most powerfull position in all of the Land has finally been filled. The Wizard holds the Grand Key to all that is Stretch and Gooey! I want to thank all my fellow collectors and friends i have made over the years for your help and support.Wihout all your emails and heads ups on auctions,I could have never done it without you.i also want to thank the many mny followers of Stretch Armstrong World.You have made this a real joy for me with all your emails,questions and concerns over the past seveal years.I hope to keep things interesting for the next several years as i update my website with more pictures and stretchy stuff.